I really can’t believe it’s the end. What turned out to be one of the most rewarding and at the same time challenging four months is all behind and I’m finally going home. I’m so excited, in a few short days I will be able to hug my family and friends back home, something that I’ve missed so much. Lily iris florentina is an ancient symbol of Florence. When April hit they started blooming everywhere and it was so beautiful. To write about my entire experience is simply impossible because every day was different. Some days were so so good, while others seemed like it would never end. Each day was so unpredictable, something that I was so unused to back at home but grew to appreciate. 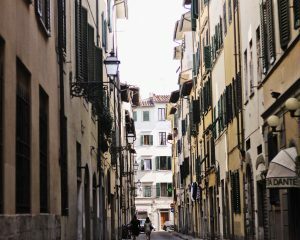 Even after three months into studying in Florence, the streets never ceased to amaze me. 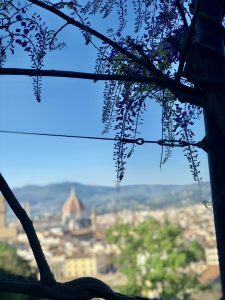 On my last night at Florence I had a conversation with some friends about how we were going to answer the question “How was Italy?” when we get home. We decided that this question could not be answered with a simple ‘it was amazing’ ‘it was the best semester of my life’ statements. To authentically answer that question, I would really need to sit down with you over a nice cup of coffee and chat. But all in all, if I could summarize experience into a few words I would say it was an eye-opening experience that I am extremely grateful for. I’m grateful for the hard times and much more grateful for the good ones that came as a result of it. 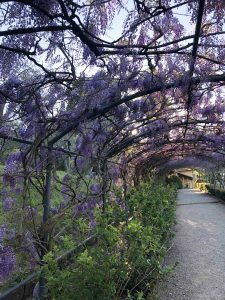 If you are studying in Florence you have to pay a visit to the Bardini Gardens. Being able to call this city home, and being able to country hop around Europe helped me realize that the world is actually huge. People say that the world is big but you don’t get the full grasp of how big it is until you are travelling for an entire semester. There is so much to see and I realized that I viewed my life in a narrow-minded way I won’t be able to see all that is left of this world. It gave me the spark to continue to challenge myself and leave what I know to pursue what I want. 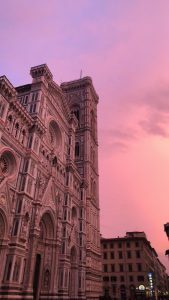 One of the most beautiful sunsets I’ve seen in Florence. If someone asks me if they should study abroad I will say that they should without hesitation. The experiences that I’ve had and the memories I’ve made these past four months make up some of the most precious times of my college experience. Studying abroad DOES change you one way or another. At the end of the day, it is your decision how you want to embrace and apply those changes towards the life you live. 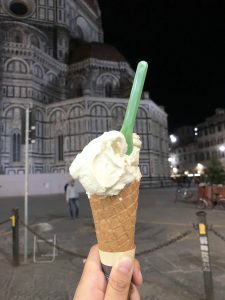 The white wine flavored gelato from Eduardo near the Duomo became our favorite place really quickly. Fun fact: this Gelato shop is Beyonce’s favorite! Rachel was a spring 2018 SAI Florence student from the University of Missouri.